July 2, 2016 by Vinay Leo R.
Linking this to Daily Post, The Poetry Pantry at Poets United, and with Open Link at Imaginary Garden with Real Toads. The pyre is lit, but what burns? What is gone with the flames? Distant, yet close, every way. Image Source, via Wikimedia Commons. It is always hard to let go of someone physically. The memories stay, the emotions stay, the love remains too. It is just not physically manifestable, and that is what burns on the pyre, the ability to tell someone how much you love them and watch their face light up in a smile, the ability to spend time with them and do things together, the comfort you get with a simple hug, or the strength you get just by holding their hands. Indeed, what burns! What really IS consumed with the flames! Yes. Thinking of such a time, I am still not sure, Mary. It’s something to contemplate, but no real answer perhaps. It is one completely, and some of the other, I think, Jae. Makes it all the more difficult to let go. Thank you. Yes. Much more than what is visible. Thank you, MMT. It is always thus when we have to let go. Sad but true. Thank you, Suyash. Such a poignant write Vinay, its difficult to let go and deal with pain and sorrow.. I guess part of us goes in with those flames as we mourn the loss of our loved ones. Yes. Part of us goes with the flames, Sanaa. And part of them remains to take the place of the part of us that goes. I feel the close ones burn & that is for the rest of the life…a thought provoking poem…. The question in this poem is thought-provoking, Leo. I hope it is the shell only that burns, that the soul has already moved on. I hope so too, Sherry. I hope so as well. The fire takes the flesh, but so many other things–feelings, access to memories, hopes–are burned in the process… I’ve never seen a funeral where the deceased’s body is consumed by flames in front of mourners. I wonder what goes through the mind of the watchers… what is lost… and what is gained. I can’t put that to words, Magaly. I’ve seen such a funeral, but from afar, and still, the heart and the mind have felt heavy. Unsure what is lost, and what is gained. What a fabulous poem…so much to contemplate as I read and reread these wonderful lines….what does burn…the physical form, but oh the emotions and memories that come from the burning are heavy in our hearts. And those emotions and memories burn a little too, Donna. A lot that’s hidden beneath, not seen. There is always something burning, the singe of pyres heavy, but who does really have the right to mourn? I feel, those who shall miss the presence of the departed soul the most. Not everyone truly mourns such a loss, Björn. That’s a sad truth. If only what ever burned finished burning in the fire instead of perpetually searing our heart and soul. Or do I? I love how you framed your plaint in rhetorical questions. This really speaks to me. Yes. That’s a big “if only”. I wonder if everyone feels that “if only”. Glad you liked the poem, Susan and that it spoke to you. 🙂 Thank you very much. Memories don’t burn but the connection does. All that you have left of them is what is within you or the trinkets of life that recall their name, their words and deeds and those mementos too slowly lose their meaning when you realize you have really lost them. Thank you, Old Egg. Reminiscing things by seeing those trinkets still retains the burning feeling for a while, I suppose. A wise way to look at things, Thotpurge. Thank you for this view of things. Yes. Most of the times, this is true. Thank you, Gillena. I suppose. But there’s a bite to those illusionary chains that feel permanent at times, ZQ. Sigh. I am glad you liked the poem. This went straight to my heart! Poignant poem…it does not seem fair to not know the answers…but we all leave, and someone else will feel the pain for our loss..and life goes on, but oh, the pain!! Yes. Some questions seem unfair, but perhaps the answers do too, and painfully so. Thanks, Kathy. 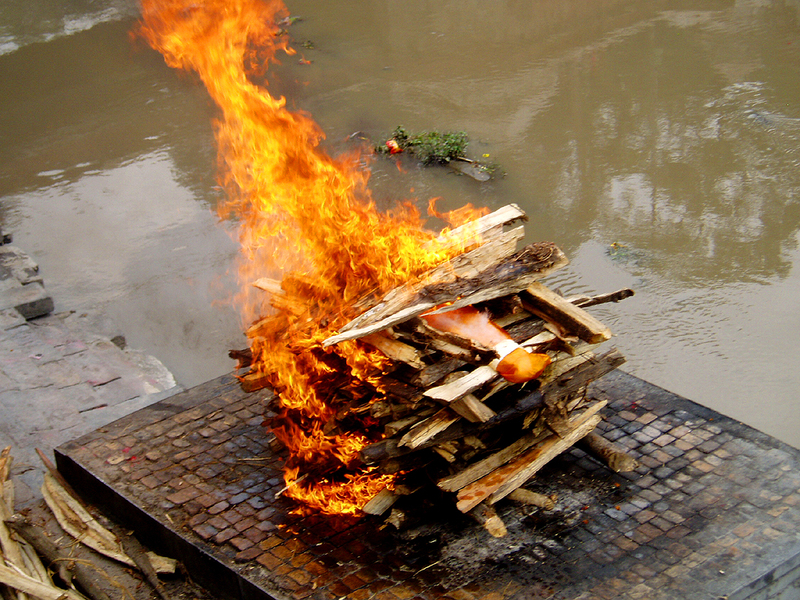 A funeral pyre is a powerful image, both literally and figuratively. Yes. It is. Thank you, Kerry. It really is a question to ponder, Vinay. Yes, something goes with the flames – can’t really describe it in words. Neither can I, Sreedeep. This was only an attempt to find some answer to the questions.